All of our guests on today’s podcast track their visits to the National Parks. Here’s how Rita V tracks hers! First an update: Our long form podcasts will now be released on the last day of each month. We also are doing shorter form podcast profiles of our guests prior to each release! This month we are discussing the very topic that gave Hashtag 59 its name. The National Parks. 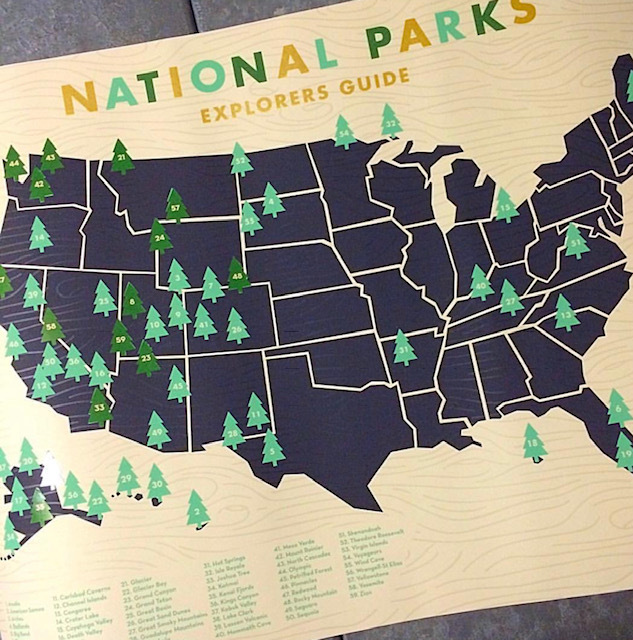 There are 59 official National Parks (not sure about you Gateway Arch!) and our name is a homage to these special places. We have two special guests joining us on the conversation to discuss our Top 10 Favorite Parks, where we’d go with one month to visit them, our most over and under rated parks, and the hike we most are yearning to do in one of them! We hope you enjoy the National Parks Podcast! Want to learn more about our guests and get some quick bits of info about our full podcast? Don’t forget to listen in to our new podcast profiles and check out our show notes below! Rita V and Holly B referred to considering a hike up Old Rag HERE, however if you are interested in the McAfee Knob hike that is actually on the AT out of Blacksburg, Virginia. You can find more info about McAfee Knob HERE. Check out more about the Big Bend Fossil Exhibit HERE. Are there now 60 National Parks? Here is some more INFO! Here’s a photo of the McAfee Knob photo opp that we talk about in the podcast! 6. To learn more about all of our under and over rated National Parks head HERE to our blog archives and read thru the National Parks Archives. 7. To read more about the reintroduction of wolves at Isle Royale National Park head HERE. 8. To fund the National Parks head HERE. 9. To see the full list of all 417 National Parks, Monuments, and Sites head HERE. 10. Follow the National Park Patch Lady HERE. 11. Read more Rita V’s rainy adventures in Olympic National Park HERE. 12. To get a glimpse of Observation Point and Mike’s book cover head HERE. 13. Check out Red River Gorge HERE. Everyone thinks it should be a National Park! 14. We don’t have the doodles created yet, do you want to see them? Let us know! Thanks for tuning in to our National Parks Podcast! What are your five favorite National Parks? Have more questions about one of the parks or hikes we discussed? Comment below!